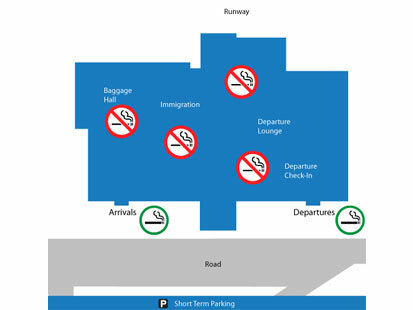 Smoking is prohibited at both aerodromes at Owen Roberts International Airport (ORIA) on Grand Cayman and Charles Kirkconnell International Airport (CKIA) on Cayman Brac. In accordance with the Tobacco Law enacted in 2008, smoking is not allowed inside the Airport Terminals and their immediate surroundings. This also includes electronic cigarettes. Therefore, in the interest of its employees and the public and, in keeping with the CIAA’s high standards of safety, the enforcement of this Law will remain a high priority. However, there are designated smoking areas located outside Owen Roberts International Airport and at the Charles Kirkconnell International Airport.